Fantasy Flight Games is proud to announce the upcoming release of Blood on the Altar, the third Mythos Pack in The Dunwich Legacy cycle for Arkham Horror: The Card Game! 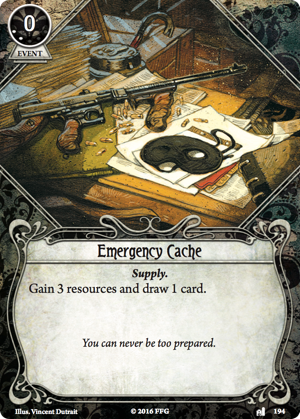 Meanwhile, the player cards in Blood on the Altar allow you to translate the experience you gained in your previous adventures to Permanent new Talents, several new assets, events, and skill cards, and a higher-level, more efficient version of the Core Set card, Emergency Cache (Core Set, 88). The deeper you find yourself amid the mysteries of The Dunwich Legacy, the higher the stakes. If you hope to survive—not to mention discover and deal with the terrible forces behind the recent events—you will need to learn from your experience. You will need to master new Talents and arm yourself for greater challenges. You are, after all, throwing yourself headlong into a nest of supernatural horrors. Fortunately, for all the evils it calls forth, Blood on the Altar also allows you to arm yourself with any of five new Permanent Talents, each of which offers a new variation upon—and complement to—one of the skill-focused Talents from the Core Set. 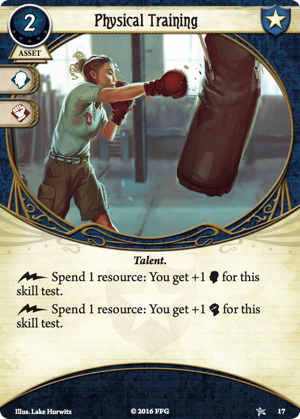 For example, if you were relying upon your Physical Training (Core Set, 17) to help you overcome some of the most terrifying or physically demanding threats you might face, you could consider investing experience points in Keen Eye (Blood on the Altar, 185) or Blood Pact (Blood on the Altar, 191). Like Physical Training, these Talents stay with you and offer you the means to boost your skills as needed. Also, like Physical Training, they come free of any slot requirement. But that's pretty much where the equivalencies end. Because they are Permanent, both Keen Eye and Blood Pact start in play once you spend the experience to "buy" them, meaning you'll never need to draw either. Also, because Permanent assets don't count against your deck size, you don't need to swap out any other cards in order to include either of these. Finally, Keen Eye and Blood Pact come with different costs. Keen Eye demands that you spend two resources for each point you want to increase your combat or intellect, but the bonuses then last until the end of the phase, making it more expensive—compared to Physical Training—to combat an enemy once, but less expensive to hit it three times in the same round. 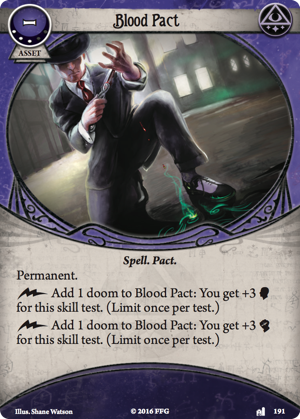 And with Blood Pact, your investigator gains the ability to use doom as a resource, increasing his or her combat or willpower by three—but only at the risk of accelerating the enemy's designs. 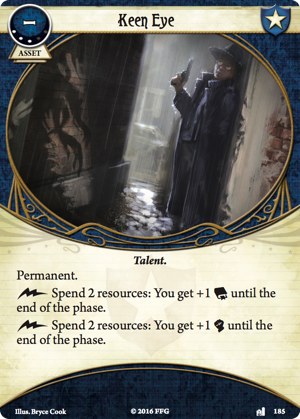 The world of the Arkham LCG® is one of buried secrets and realities that lie just beyond the periphery of our natural senses. So it is that throughout your adventures in Blood on the Altar you'll find yourself unable to shake the eerie feeling that there's more to the town of Dunwich than first meets the eye… Of course, there's a reason to this: somewhere, beneath one of the village's buildings, you will find a secret chamber that holds such monstrous truths as to test the limits of your sanity. In Blood on the Altar, even as secretive forces move against you, you must race through the town and discover this secret chamber. You must also find the key to unlock it. And then you must enter. How are the disappearances in Dunwich connected to the strange events taking place in Arkham? The truth may lead you closer to your goal—or it may drive you mad.